After ten books, this is the last adventure for Destructive Delta and the last time Dex and Sloane will work together before their wedding and their move to TINS. Over the course of this series, I’ve grown attached to the whole team and their many friends. While some of the most recent books seemed a bit like fillers, this final story reminded me why I fell in love with the THIRDS series in the first place. Like the best books in the series, it is full of action, humour, and romance. The focus is back on Dex and Sloane as their wedding inches closer and I love the way their relationship has developed over the course of the series. This feels like goodbye. From the start, the members of Destructive Delta know that their time together as a team is nearly over. There are some really touching moments as characters and relationships struggle to readjust. It’s a pretty special goodbye and it does the series and the characters justice. However, I’m still holding onto the hope that we may see a little more of Dex and Sloane in their new careers. I’ve loved this series from the start and I don’t think I can bear to let these characters go just yet. This is a great story. It has a ton of action and there are a lot of things that are revealed. I enjoyed the banter, as always with these characters and really liked that we were able to learn more about the secondary characters and other relationships in the story. Dex and Sloane are getting ready to walk down the aisle, but there are people vying to destroy the happiness that they have started and will stop at nothing to take down TINS and the people who are part of the organization. There is so much going on and the stories all kind of culminate in this one. I don't want to write too much because it will give the story away, but this feels like the end and there could be some good spin off material in this one too. I remember when I read the first book in this series that I thought the book was too wordy. Who knew that 10 books later, I would be begging for more words. This book was amazing. I didn't want it to end. So much happened, we learned a lot and we once again have questions that need answers. One thing is for sure, Dex and Sloane are one of my all-time favorite couples. These two just melt my heart in so many ways. Simply an amazing addition to the series. This group of characters shows what true friends and family really is. Love, love, love!!! 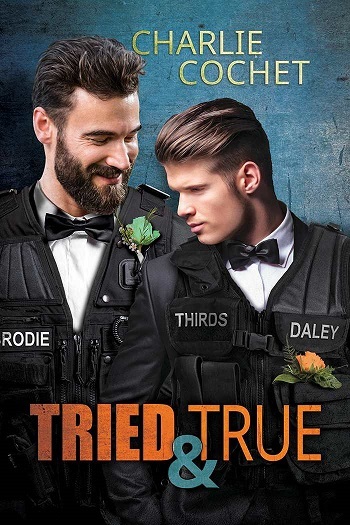 Reviewers on the Wicked Reads Review Team were provided a free copy of Tried & True (THIRDS #10) by Charlie Cochet to read and review.